The Rexel Alpha Strip-Cut Shredder is an entry level home shredder capable of shredding up to 5 sheets of paper at a time. 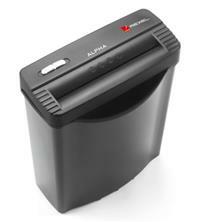 This ribbon cut shredder shreds documents into strips which are 7.25mm wide. It has a P-1 security rating, so is recommended for basic shredding, rather than the shredding of confidential documents (for these, consider a cross-cut shredder which shreds material into smaller, harder to piece together particles). The shredder has a 10 litre capacity bin which can hold up to 30 shredded sheets - to empty it, you simply lift off the head. As well as paper, this shredder can also handle the odd paper clip and staple so you don’t need to worry about removing all of these prior to shredding. Size-wise, the Rexel Alpha Strip-Cut Shredder is very compact, so it can easily be placed under a desk or tucked away when not in use. It’s also very lightweight. Other features include: a safety feature to prevent overheating; and a reverse option to help clear any paper jams. Warranty is 2 years for the machine.